When the holiday season starts and the winter chill comes around, the heating bill at your property will naturally increase as you keep yourself warm and cosy. 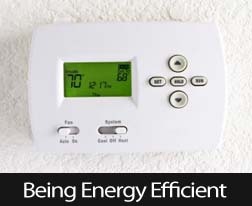 However, if your home is not being heated efficiently, you are essentially letting your hard earned dollars escape into the air as wasted energy. If you work from home and are spending eight hours of the day sitting in your home office, there is no need to keep the rest of the house toasty warm. If you have heaters that you can turn on and off for each room, you can direct the heat to the room that you are using. 0If you have a spare bedroom, you don’t even have to heat it at all unless a guest is coming to stay over. If the air filter on your furnace is getting old and clogged up, it will block the airflow from the furnace itself which is a huge waste of energy. This will mean that your furnace works less effectively and it will also reduce its lifespan. It will only cost you $20 to change the air filter, but this little fix will make a big difference in the long run. You might think that turning on your ceiling fans in order to save money on heating makes no sense, but hear me out on this one. When you turn on your fans in reverse, they will actually draw the warm air throughout the house – helping to circulate it and keep it warmer. If you live in a cold climate and you can walk around in your house in a t-shirt and shorts comfortably, you’re wasting money! If you wear warm clothing indoors during the winter, you will be able to keep your thermostat several degrees cooler and you will save yourself a lot of money over the winter. These are just a few simple ways that you can reduce the heating costs for your property this winter. For more helpful tips and advice, feel free to contact your trusted real estate professional. This entry was posted in Around The Home and tagged Around The Home,Energy Efficient,Heating Tips In The Winter. Bookmark the permalink.